A plan to build a $1 billion, 1,100 megawatt natural gas plant near Detroit puts Michigan at risk of overbuilding capacity and crowding out renewable energy, according to clean energy advocates. The Michigan Public Service Commission is expected to vote on a “Certificate of Necessity” for the DTE Energy project as soon as Friday, but opponents say regulators should postpone a decision until a long-range planning process can more holistically assess the need and renewable alternatives. The project was first proposed in August, and DTE plans to break ground next year if approved. The company says it’s “one of many steps” taken to retire its coal portfolio in the coming decades. DTE retired 510 MW of coal over the past two years, and plans to retire another 1,970 MW by 2023. The utility has announced renewable energy projects to comply with the state’s renewable portfolio standard, but the 1,100 MW plant would make up the remainder of the utility’s capacity required by the regional grid operator, MISO. The decision comes just ahead of the implementation of Michigan’s new long-term, Integrated Resource Planning requirements for utilities. Companies will soon have to file regular forecasts of generation needs decades into the future, part of energy laws passed in 2016. This planning will “test how different future resource plans perform relative to each other with respect to affordability, reliability, adaptability, and environmental stewardship,” according to the MPSC. The energy laws also add new Certificate of Necessity requirements. Critics question the timing of DTE’s proposal, made about six months before the MPSC issued the new planning guidelines. 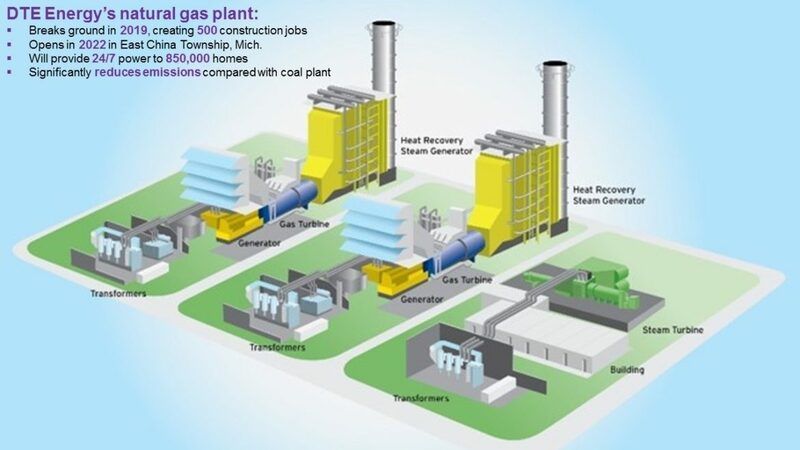 State regulators have said the gas plant likely wouldn’t be approved under Michigan’s new requirements because the company didn’t adequately consider alternatives. Cole said there are no other gas plant proposals before the commission that were filed before the new requirements. Some groups argue DTE should be subject to the new rules, and that the company deliberately filed plans before they took effect. “I think it was absolutely intentional,” Gomberg said. And the company’s modeling from 2016 or earlier is already outdated, he added. “I’m hopeful that the new (Integrated Resource Planning) process will help alleviate some of the issues we’re seeing in the DTE” case, Gomberg said. While utilities often tout the need for reliable, “baseload” generation to replace coal, critics say the thinking is outdated and exaggerated. The goal should include upgrades to the distribution system while emphasizing flexibility, not reliability, they say. “Sure, there’s an argument about reliability — but at what cost?” Larry Ward, executive director of the Michigan Conservative Energy Forum, said at the group’s conference last month in Lansing. The MCEF opposes DTE’s plan, arguing wind, solar and energy efficiency are cheaper alternatives that don’t lock in uncertain long-term costs. When coal units retire, a one-to-one ratio of capacity isn’t necessarily needed. Some utilities already have excess capacity over what’s required by the regional grid operator. Demand-side resources such as energy efficiency and demand response are also playing a growing role in Michigan’s portfolio. Irene Dmitry, DTE’s vice president of business planning and development, says the company’s plan meets MPSC requirements for a Certificate of Necessity, and that it will follow new integrated resource planning rules when it files its plan in March 2019. She added that the St. Clair project was in development for more than two years when it was filed in 2017. Utilities’ capacity requirements are governed by the regional grid operator, Midcontinent Independent System Operator (MISO). They need to show their future capacity needs as well as a reserve margin. Under Michigan’s 2016 energy laws, Michigan utilities must also demonstrate to state regulators their anticipated capacity needs through 2021, which is based on planned retirements and new construction. DTE does not predict a capacity shortfall, assuming it builds the 1,100 MW plant in St. Clair County, according to the MPSC. Retiring its planned coal units would create a capacity shortfall, the MPSC says. Going forward, Cole says utilities will be required to consider additional options like renewables and third-party projects. “We’ll see if (renewables) are selected based on economics” after the RPS is met, she added. Still, Gomberg says the decision-making around new plant proposals is too narrowly focused on the short-term. James Clift, policy director with the Michigan Environmental Council, agrees. “We expect some natural gas would be getting built. Our main concern is we’re potentially seeing an over-commitment to natural gas at the expense of clean energy resources available,” he said. Where utilities, regulators and advocates agree is that Michigan — like the rest of the country — is at a major turning point in developing its energy mix. The transition is exacerbated by the retirement of uneconomic coal and, in some cases, nuclear plants, which add another layer of complexity for zero-emissions generation. Dmitry emphasized reliability concerns with renewables compared to gas, even though the company supports renewable energy. Like most major utilities in the region, DTE has made long-term emission-reduction pledges and are committing to increased renewables. By 2050, DTE plans a portfolio that’s 40 percent natural gas, 40 percent renewables and 20 percent nuclear, officials announced last year. On May 3rd, DTE stockholders will vote on Proposal 5 – which would require DTE to do a study on the economic benefits of shutting their nuclear reactor Fermi 2 down before the license expires in 2045. I hope it passes.